Preschool is an ideal time to introduce children to school bus safety because many of them will begin riding the bus regularly in elementary school. Teaching familiarity with the bus ahead of time can alleviate anxiety and ensure that each child is prepared for a safe and enjoyable ride. Topics are set so that lessons taught at the beginning will be revisited throughout each lesson to add detail and reinforce information. If necessary because of time constraints, the real bus experiences can be condensed into a single day. If one of the final art projects is not appropriate for your particular classroom, many other options are available. If you need help downloading the printable lessons, check out these helpful tips. The goal of this lesson is to introduce children to the school bus, its purpose, and the fact that they may ride a bus to school - without mom or dad - in the near future. It will also introduce the idea that there are rules for the school bus just like there are rules for the classroom. For children with older siblings, some of the material may be familiar and will serve to reiterate and add to what they already know. 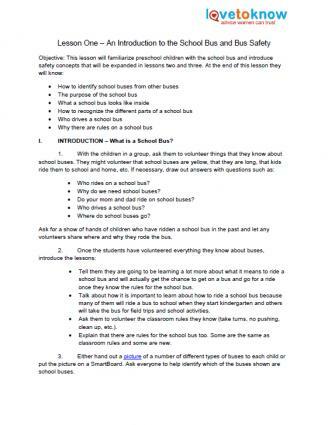 The lesson will introduce children to recognize what a school bus looks like, how it is different from a car, who rides a school bus, where school buses can take you and how to behave on a school bus. It will also reassure children that they cannot get "forgotten" on the bus and familiarize them with the bus driver. They will then visit a real school bus and put the skills they practiced into use. The first visit to a real school bus will focus on the basics: getting on and off, selecting a seat, sitting quietly, sharing a seat, and recognizing the bus driver. The final project will have students create their own personal school bus out of an egg carton to be used in future lessons. They should be able to identify each part of the bus and discuss how it is used. The goal of this lesson is to teach the students about how to be safe on the bus without creating fear or anxiety. Children will learn that bus safety is important so that the driver can do his or her job and get the students to school on time. This lesson will expand on the behaviors taught in the first lesson. Topics will include how to sit appropriately, how to use seatbelts (if applicable), or why they can be safe without seatbelts, why it is important to be quiet and where to stow their bags. The mock bus and real bus activities will give students the chance to practice the rules they established in the introduction. They will understand that it is a good idea to practice a bus drill, just like a fire drill. Like with the first visit to the bus, students will board the bus, greet the driver and find a seat. They will then practice evacuating the bus from the rear door. For their final project, students will create a "town" in the classroom to use with their egg-carton buses. 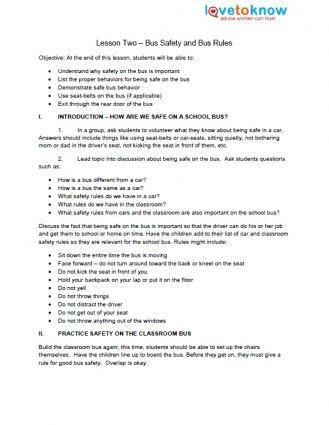 This will help familiarize them with the concept that buses drive all over town, and that it is important to be safe every time the bus is moving and when getting on and off. 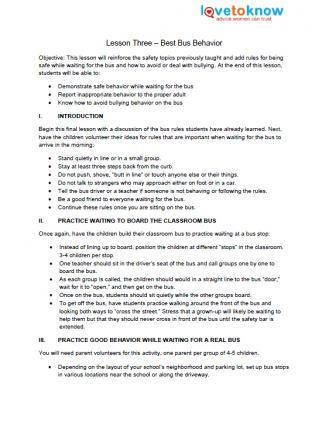 Students will revisit the rules they established in topic two, with a focus on how they should treat other students and the bus driver. The discussion will include what to do if they see someone misbehaving, what to do if they have a problem and the fact that good bus behavior includes the time they are waiting at the bus stop. Because these are young children, the issue of bullying will focus primarily on ideas such as "being a good friend" and talking to the driver or their teacher if they see something they think is wrong. As part of the classroom bus and real bus activities, students will start by waiting at different "stops" for the bus to pick them up. The real bus activity will culminate with a short ride. The final project will have students create a mural of a school bus with a self-portrait of one student in each window. Used together, the three lesson plans should prepare students to ride a school bus. You may need to modify parts of the plans for your school or area's specific situation. For example, children who will likely wait for the bus in very urban or rural areas may need extra instruction about their surroundings. Getting parents involved in the lessons is also a good idea, so they can reinforce the things being taught at home.